The original PC release of Carmageddon: Max Damage launched with a “US Election Special” mode, taking inspiration from topical current events – as two of the least-liked meat sacks on the planet slugged it out to become the Most Powerful Person On Earth. This Special Edition has these game modes still in place, because it remains just as funny now as it was then to show the President and the failed candidate what you think… By MOWING THEM DOWN IN A VIDEOGAME! Not just once, but over and over again… Impale a horrified Hillary on the end of your mighty rod! Repulsificate demented Donalds straight to frigging CHINA! It’s hours of FUN for the whole FAMILY! – Trumped-Up where every pedestrian is respectfully replaced by the President of the United States. – Hillaryious in which you’ll meet nothing but duplicates of the defeated Democratic candidate. – Mass Debate which features a politically correct balance of both characters. The new environments are amalgamations of the best bits from the numerous chunks of landscape that we all loved to tear around in Carmageddon. “Bleak City”, “Devil’s Canyon”, “Dusty Trails”, “MagNuChem” and “Snowy” levels all return in updated forms, with their memorable landmark features such as the Loop ’de’ Loop, acid pits and Football Stadium. Everything is reassuringly surreal; hell, we’ve even managed to incorporate a giant food mixer into a level! PowerUps are back and this time they’re even funnier, surrealier, hurtier, and messier than ever! Lots of the classic PUps return in super-enhanced form, such as Repulsificators, Kangaroos & Solid Granites. Then we have all new PUps like “Pelvic Thrust” and a variety under the heading “Tossers”! Combine PUps to create hilarious combo results like Groovin’ Helium Filled Peds, or Peds without legs at a Temporary Rapture! 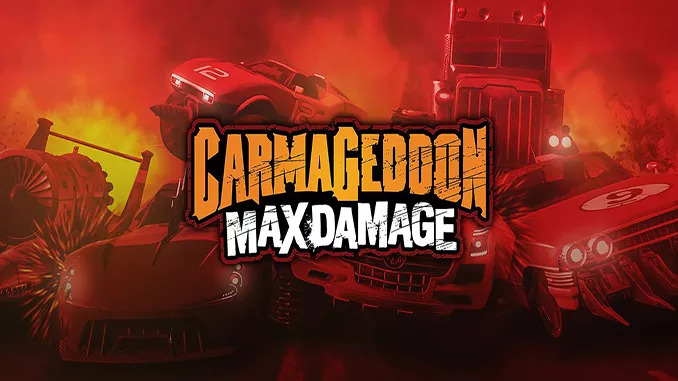 The original PC release of Carmageddon: Max Damage launched with a “US Election Special” mode, taking inspiration from topical current events – as two of the least-liked meat sacks on the planet slugged it out to become the Most Powerful Person On Earth. Can you post Ion Maiden?